The vitality of our community's development owes a great debt of gratitude to the men and women who have dedicated their lives and careers here. This series of images has been organized out of respect to their longstanding service. Our future in a multitude of ways depends on success of our Port and how it continues to evolve both in its traditional role for the movement of freight but the evolving public access and development that are presently on the drawing boards. 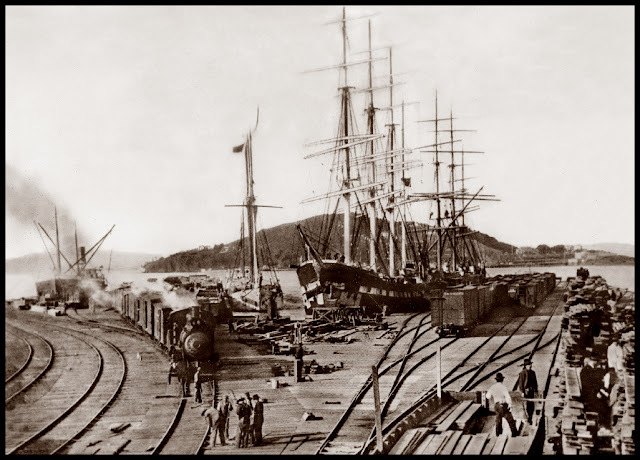 This massive railroad wharf and ferry pier, located at the foot of Seventh Street, was acquired and extended by the Central Pacific Railroad in 1868 to transport freight to San Francisco. It served as the western terminus of the first Transcontinental railroad when it was completed in 1869. 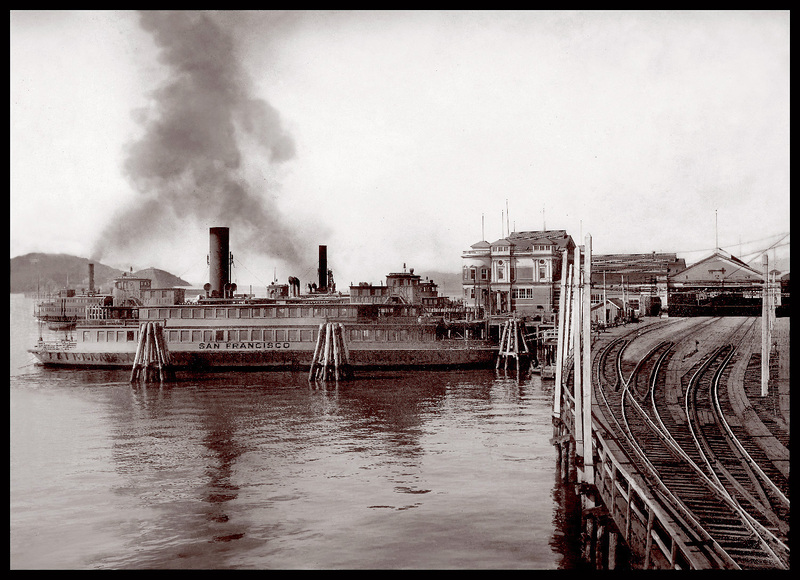 The Long Wharf connected to ferries that carried commuters and cargo to and from San Francisco. 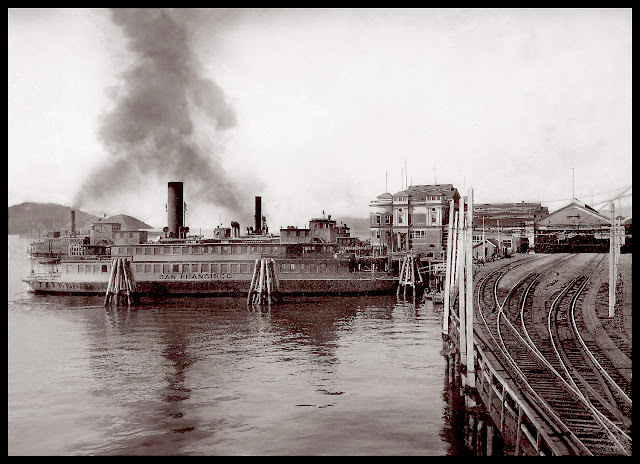 Local commuter trains also used the pier, while trains of the Pacific Railroad (aka the "First Transcontinental Railroad") used another wharf in Alameda for briefly in 1869, after which the Oakland Long Wharf became the western terminus of the Pacific Railroad as well. 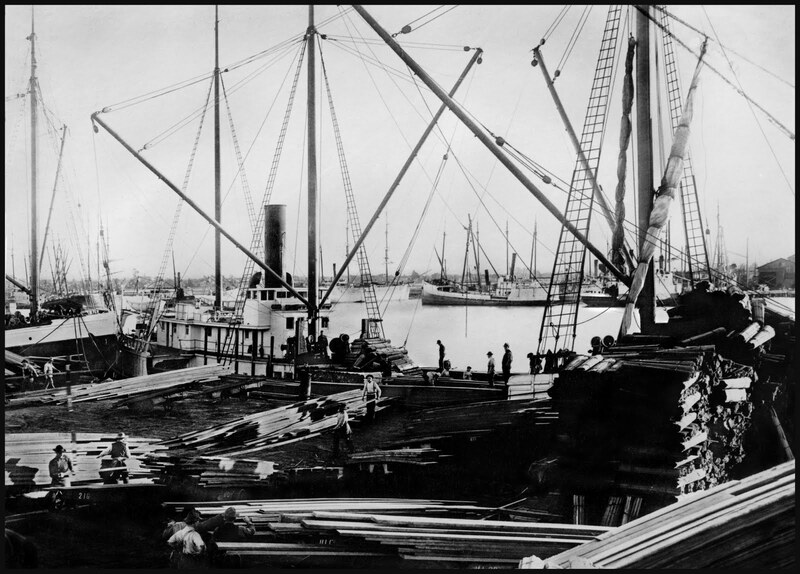 Part of the wharf was filled in between 1879 and 1882, creating a mole. It remained in service until 1958. 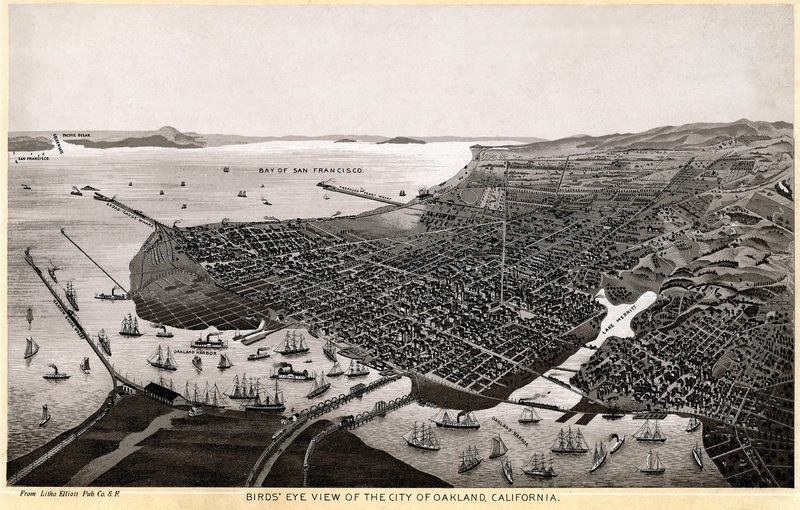 Wiki of the Mayor's of Oakland - and... there are dozens and dozens of them even before 1900! 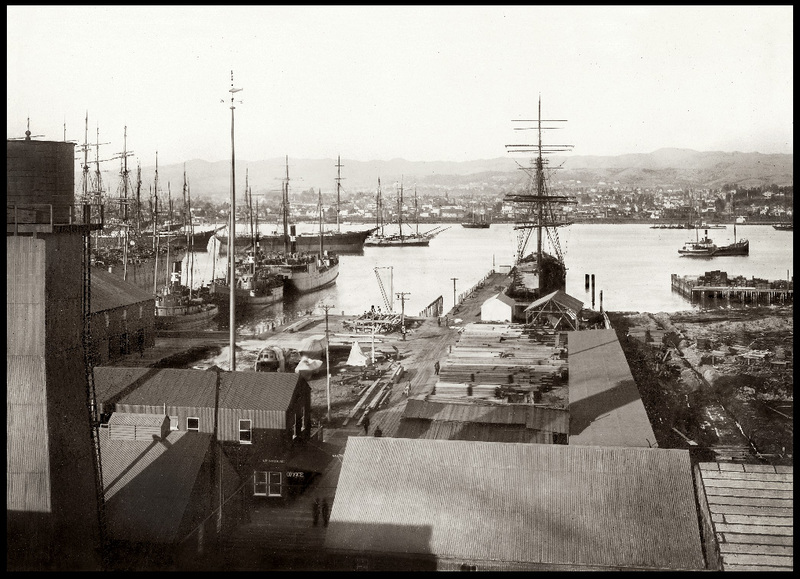 Booming commerce in the late 19th century led to the need for the expansion of shipping facilities in both Oakland and Alameda. A shipping and tidal channel was dredged between them in 1902, extending and deepening the natural estuary joining Oakland’s harbor with the San Leandro Bay. Consequently, Alameda became an “island” as well as an important shipping port. Most of the excavated soil was used to fill sections of the nearby marsh land. Brooklyn Basin is now the site of largest development on the Oakland/East Bay Waterfront, with billions of dollars being invested in this area become a major neighborhood and commercial center. for an expansion of the Port of Oakland cargo facilities. and a forerunner of the civil rights movement. 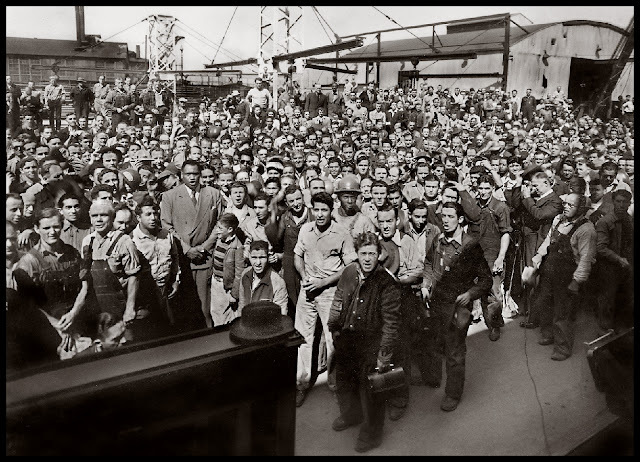 Source: Unless otherwise indicated, these images were sourced from the Oakland History Room, Oakland Public Library, and have been digitally mastered by San Francisco Images / Business Image Group. You can acquire copies of these images framed and unframed through our World Wide Archive Web Galleries. A portion of all sales will be donated to the History Room to assist them with their work preserving local history and to maintain their collections.